Purina Pro Plan is offering free samples of their Roasted Slices Dog Treats over on their Facebook page. "This January, Purina® Carvers® became Pro Plan® Roasted Slices, made with more than 80% real chicken, accented with natural seasoning and oven-roasted to bring out their real flavor and aroma. Roasted Slices is formulated without corn, wheat, artificial colors or flavors creating a snack that gives you another opportunity to Do More™." A free dog food sample form Nature's Select. "A Natural Pet Food Company... In 1994 our family started Nature’s Select Pet Foods with a simple idea - to deliver to your door some of the freshest and finest natural pet foods at a price to fit your budget. With this promise, we started by selecting only fresh natural premium ingredients like whole meats, whole grains and natural preservatives. Then we added the convenience of free home delivery, 100% money back guarantee and our personal commitment to be there to answer your questions and share dog stories." The free sample of Nature’s Select Dog Food is available to select locations in the USA, one per household. Most dog food and treats on the market are loaded with chemicals, questionable meats and low quality ingredients. If you wouldn't eat food of this quality, why would you feed it to your dog? Dogs (and people) who mostly eat a diet filled with chemicals often experience many illnesses, allergies, skin problems, and tend to live shorter lives. Switching to an organic diet can greatly improve the health of you and your dog. In this article, we are going to discuss a few of the reasons to avoid typical, mass-produced dog food and treats, reasons to switch to organic food, and suggestions on how to implement changes in your dog's diet. Have you ever considered what goes into your dog's treats and food? Take a look at the labels. What do you see there -- animal byproducts, some form of sugar, food coloring, preservatives that you can't begin to pronounce? What exactly is animal byproduct? Icky! Does your dog really need sugar? Why is the food coloring in there? Your dog doesn't care if his food is red, blue or brown. Most mass-produced dog food and treats are filled with chemicals, weird mystery meats, and stuff that leads to chronic diseases. Making the switch to an organic diet can be easy. Begin by reading labels. Look for the organic label. If organic is cost prohibitive, look for natural brands that don't contain any of the above listed ingredients. Keep in mind, the word natural on the front of the bag or box does not mean anything. You always need to read the label. Where can you find organic products? If you're lucky, your local supermarket might carry a few organic brands. Most cities and towns have dedicated pet food stores, stocked full of organic options for every budget. The staff in these stores are usually exceedingly knowledgeable and resourceful in helping you pick the right food for your dog. If you live in a rural area, feed stores often carry quality pet food products. You can shop online as well. Shipping prices for big bags of dog food are pretty spendy, but many online retailers will ship yummy, organic dog treats for free or cheap. If you're really ambitious, you can make your own dog food. There are lots of great websites with recipes and suggestions! Make the switch slowly. If your dog is used to a chemical filled diet, he may go through a detox period. This can cause him to feel ill, as the toxins flush out of his system. In extreme cases, nausea, diarrhea, and passing worms may occur. By changing the food very slowly, you can minimize his discomfort. Try adding just 25% of the new food to each meal for a week, then increase to 50% for the next week, and so on. If your dog does become ill, be sure to contact your veterinarian right away. * Many dogs love carrots. Keep a bag in the fridge for you and Fido to munch on. * Broccoli is another super healthy treat. * Natural nut butters are great for dogs. They are full of beneficial fats that are great for their skin and coats. * Small pieces of apples are tasty and healthy. * Before you try a new vegetable or fruit for your dog, be sure to do a bit of research to make sure they are safe. For example, onions and grapes are both toxic to canines. I hope you've been encouraged to consider making the switch to organic dog treats and food. Your four-legged friend will thank you! Visit http://www.squidoo.com/dogs-gone-organic for great shopping resources, recipes and suggestions. Julie Coburn is passionate about helping you and your pets live vibrant and healthy lives! Halo is offering two free cans of their Spot's Stew dog food when you sign up for their e-mail newsletter. "Real food with simple ingredients you know and recognize. Slow cooked complete and balanced recipes. High moisture formulas for added hydration. Holistic Nutrition Made with Only the Best Real Food Ingredients. Exclusively uses only real chicken, turkey, lamb, beef or wild salmon. Farm raised fruits, vegetables and whole grains. Formulated with added vitamins and minerals. No artificial, flavors or preservatives. Interchangeable formulas for added variety. Complete and balanced for all life stages." Have swollen paws or inflamed ears? It could be that allergies are wreaking havoc on their system. Just like in people, your healthy pet’s immune system should react to bacteria and viruses by manufacturing antibodies that allow its body to mount an immune response against these unwelcome invaders (pathogens). Your pet’s immune system also encounters hundreds of particles every day that are not harmful, rather are just part of the natural environment. Under normal circumstances, these substances (ragweed, grasses, pollens, molds, foods, etc.) should be recognized by the body but not be considered foreign invaders. In the case of pet allergies, however, an over-active immune system processes and interprets common substances as a toxic assault. And when your pet’s body mounts an immune response to common, normally harmless substances, or allergens, allergic symptoms appear. 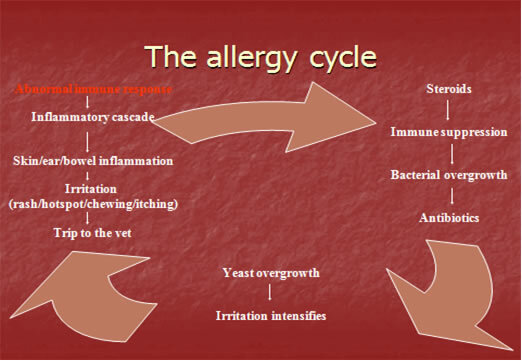 There are two types of allergic responses that pets can experience: food and environmental. Your companion can be allergic to one type of tree or every outdoor allergen, allergic to only wheat or every starch. Some pets even inherit sensitivities to certain foods and environmental factors, and in these cases often demonstrate allergic symptoms early in life. For other pets, allergies are acquired over several years of continual exposure to the allergen. What may your pet be allergic to? The truth is, animals can react to anything in their environment -- even water is a possibility if it’s contaminated with impurities. Collar and bedding materials (cotton, etc. ), cleaning supplies, household chemicals and dust mites are all relatively common household allergens that could cause your pet to have an allergic reaction. As you’re trying to figure out what allergen is causing your pet a problem, keep in mind that some pets have both food and environmental allergies. If your pet itches during the spring, summer or fall, they are most likely reacting to something they are exposed to at that time. But if your pet continues to have allergic reactions after outdoor allergens have been buried under snow, it points more toward a non-seasonal, or year-round source of allergy, such as food. That said, if you live in an environment that does not have a hard freeze in the winter, environmental allergens can really build up and cause year-round issues for our companions. Allergy testing can be done to determine what substances your pet is reacting to at that point in time. Allergy panels can yield very different results when conducted over several months, demonstrating that the immune system can over-react to many different substances at varying times of the year. This is the point, exactly! Food allergies have been shown to occur more in pets that are fed only one food source for a prolonged period of time. Your pet’s immune system can become bombarded with the same allergens for so long that it begins to react negatively to the food source. Not really, as dogs and cats were never meant to ingest foods containing such high amounts of carbohydrates (the average commercial dog food contains over 50% grains), and were certainly designed to consume more than one protein source over a lifetime! If you suspect that your pet has a food allergy, a food trial, or allergy elimination diet, can help you figure out which foods are the problem. Once your companion has developed an allergic reaction to a substance, those reactive antigens can circulate in his bloodstream for up to 6 weeks, causing inflammation and irritation. This means that an allergy elimination diet should last at least six weeks, sometimes longer (I recommend a full 3 months). During this period, pets must not eat any foods or treats suspected of causing a reaction. A single bite of a problematic food can cause a flare up that lasts several days, so complete elimination is essential for the process to be successful. After your pet has been given adequate time to clear the allergic substances from his body, new foods can be added slowly back in, as you watch the animal’s response after each food is added. Interestingly, many of the foods that were previously considered allergenic can often be incorporated into the diet once your pet’s body has had ample time to detoxify and clean out cellular debris. Many holistic vets theorize that it’s not the actual food protein that causes the immune system to react but the chemicals and preservatives included in the foods that cause the problem. Although we can’t say for sure, this would explain why, after making the correct dietary changes, many pets can then consume foods that they were previously allergic to. Because the symptoms of inflammation are produced from the inside out, ointments, shampoos, sprays and dips can only provide temporary relief and although are beneficial to use for improving your pet’s quality of life during a flare up, long-term treatment must focus on balancing your pet’s immune system. Steroids (also called prednisone, cortisone or the nondescript “allergy shot”) are the least optimal treatment choice, as they work by suppressing your pet’s immune system. Steroids actually turn the immune system off, which improves the symptoms remarkably fast but doesn’t address the root issue of why your pet’s immune system is over-reacting in the first place. Not only can steroids have a negative effect on your pet’s liver, adrenal glands and kidneys, but suppressing your pet’s immune system with steroids also allows for opportunistic yeast and bacteria to grow on your pet’s skin, sometimes increasing the chances that antibiotics may be prescribed. Do you see the crazy cycle? The image below does a great job of explaining it further. As an aside, keep in mind that healthy pets do not smell bad. Yeast exudes a musty smell, and if your pet smells this way he may have a problem with yeast overgrowth. Many people assume their pets should smell this way, but in reality healthy pets should only be bathed with they’re dirty -- not because they’re smelly. Bathing smelly pets in oatmeal (a grain) shampoo often adds fuel to the fire, requiring the pet to be re-bathed multiple times a week in order for the owners to tolerate the pet’s odor. The foods you feed your pet will eventually heal or harm. Feeding pets healing, non-allergenic foods allows their immune systems to rest. Rebalancing your pet’s immune system by offering natural, biologically appropriate wholesome foods is necessary to begin the road to recovery. Also remember that the more variety you include in your pet’s diet, the less likely your pet will be to react to the same monotonous foods. Nutritional variety is not only the spice of life, it’s critical for a balanced and healthy immune response -- and for keeping your pet allergy-free. Pill Pockets for Dogs - Allergy Formula - 6.6 oz - Roasted Duck and Pea - 6.6 oz - Roasted Duck and Pea. The Dog Allergy Book - This book takes an in-depth look at the most common canine allergies, exposes the symptoms and then provides you with safe and effective household remedies that you can implement immediately without spending hundreds of dollars on vet bills. What size Dog Toy is appropriate for your Labrador Retriever? In our last post we talked about Dog Toys and your Labrador Retriever and stressed the importance of our responsibility as Labrador Retriever owner’s to provide appropriate chew toys and play toys so we can steer our lovable Labradors in the right direction. In the next part of this series, Elise McMahon of Canine Head Start will discuss what size toy is appropriate for your dog. She talks about toys for small and large dogs and of course we all know that we will be looking for the large size for our Labradors. You always want to buy a dog toy much larger than the size of your dog. You want to make sure the toy you are giving your Labrador Retriever is appropriate for them in size. When a toy gets too small or starts losing pieces, you want to throw it out! We stress this all the time on the All About Labradors blog. You don’t want to give your Labrador Retriever anything that they could fully ingested without chewing, which can cause problems with that item being stuck in their mouth, throat or in their digestive system. Walmart and Purina are offering Free Purina Pet Gear Training Pad when you buy and size Purina Puppy Chow brand puppy food. These won't last long so don't delay. The Free Purina Pet Gear Training Pads are limited to one sample per household and are only available to consumers in the United States. Each week form 4/4/11 through 5/22/11 you have the chance to get a coupon for free Innova dog or cat food or treats in the Win A Year’s Supply Of Innova® Pet Food Sweepstakes. For the week of 4/11/11 - 4/17/11, if you're one of the first 2000 to enter, you'll get a coupon for a free can of Innova® wet dog or cat food. About Innova: "Innova was the first true holistic health food for pets. Every dog food, cat food and pet treat in our line is made with farm-fresh, natural ingredients from the five food groups to supply optimal nutrition for peak performance at every life stage. No other pet food supplies so much natural nutrition in a pet food your dog or cat will actually eat – and enjoy!" When you enter the sweepstakes you will also have the chance to win a years supply of Innova® Dog or Cat Food! Your chance to get your coupon for Free Innova Dog or Cat Food starts on 4/11/11 at 12 AM EST and is available to residents of the USA and Canada. We will post weekly reminders on All About Labradors to let you know each starting weekly date. What can my Labrador Retriever chew on? Should I give my Labrador Retriever dog toys? What kind of dog toys should I give my Labrador Retriever? Many of these questions are e-mailed to us here on All About Labradors. In the following video series, Elise McMahon of Canine Head Start, provides wonderful information on all kinds of questions you could have about dog toys. In this first video, Elise stresses the importance of toys for our Labrador Retrievers. She talks about our responsibility as dog owner’s to provide appropriate chew toys and play toys so we can steer our lovable Labradors in the right direction. Over on the Variety Pet Foods Facebook page they are offering a free sample of Mixables dog food. "Mixables is the original wet dog food specifically designed to mix with any dry dog food. All Mixables recipes come in easy-to-use, single-serving pouches. Simply grab a pouch, tear off the top and pour it on your dog’s favorite dry food. Then sit back and watch them enjoy a great tasting meal every day. They’ll Love You For It!" To get your Free Sample of Mixables Dog Food you have to "Like" Variety Pet Foods on Facebook. Only available to the first 2,500 people so you have to hurry. Click on "Get Mixables" in the left hand sidebar to request your free sample. Credit goes out to a loyal family Labrador Retriever, who helped save the life of a missing South Carolina toddler. According to reports, on Friday night, Tyler Jacobson, a 22-month-old toddler, dressed in only a T-shirt and diaper, had wandered off into the woods surrounding his South Carolina home. After being reported missing by his mother, police searched the area on foot and with an infrared-equipped helicopter but had no luck. Police decided to call off the search until the next morning due to high winds and the darkness. Shortly after the morning search began, a neighbor reported hearing crying from the woods about a quarter-mile from the family's home. Police found an uninjured Tyler huddled up with his loyal Labrador Retriever, Skyler. Police state that the Labrador Retriever apparently kept watch over the boy throughout the night, as temperatures dropped down into the 40s. Kershaw County Sheriff Jim Matthews has stated that "I believe that the dog being with him is what kept him alive".